While our facefeeding was in full flow, that Fabio Capello was in town (note) about 400m away opening shiny Suffolk New College. Our Italian buddy remarked: "I visited this ... city long time ago when I was a player." There we go, instant city status. He wouldn't be drawn about either Stoke Bridge or Roberterry. And I dream I'm on Eagle Street, a boulder's roll from Janet's. Over there is Central City Comics, home to Grant Morrison and The League of Extraordinary Gentlemen. 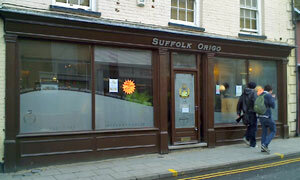 Over here is Suffolk Origo, home to Noam Chomsky and The Koran For Dummies. In fact, it's only when you glance through the bookcases here that you suspect that there's some sort of angle -- this is a Muslim community centre doubling up as an internet cafe, or vice versa. Whatever, the chow is cheap and plentiful and good. Spy-like, I come in from the cold to find that the brio trio have commandeered a comfy couch. Choice is also threefold: potato (baked), pizza (slice) or pasty (assorted). Giant Cornish, please, plus a bag of Walkers and an Oasis, all for less than £3. Margins must be minimal. Old Ipswich b&w images by Francis Frith contrast sharply with new Ipswich panoramic colour images of the rejuvenated waterfront. Like them a lot, hanging above the flatscreen monitors. That processed pastry disappears soon enough and we're on to the sweet course. All remaining carrot cake (with cream filling) is spoken for afore I get there; Rene is kind enough to share his. With space still to fill, I'll take some Carte D'Or, which, at 40p a scoop, is a subzero steal. It comes to me that I used to visit these premises for Game Gear goodies. That dates me. Lady behind the counter hasn't done an Americano before, but it comes out fine c/w caramelised biscuit on the side. Cosy and warm in here with ample reading material (inc. "normal" mags like Q) to browse: should I stay or(should)Igo? If it was a car -- Renault Twingo. If they were passing by -- Will Self.